Maoist chief Prachanda today said the grand Left alliance will "end Nepal's elongated political instability" by forming a strong government that would ensure stability and prosperity in the country. 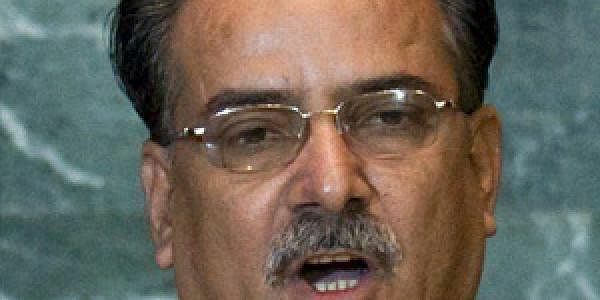 KATHMANDU: Maoist chief Prachanda today said the grand Left alliance will "end Nepal's elongated political instability" by forming a strong government that would ensure stability and prosperity in the country. CPN-Maoist Centre Chairman and former prime minister Prachanda made the remarks here while unveiling the election manifesto of the grand leftist alliance. CPN-UML chairman K P Oli was also present on the occasion. The CPN-UML and the CPN-Maoist have forged electoral alliance for both the provincial and parliamentary elections giving a tough fight to ruling Nepali Congress, which emerged as the largest party in the last parliamentary elections. Prachanda claimed that the left alliance was forged to bring political stability and prosperity in the country. He said the objective of the alliance was "to end the countryÂ’s elongated political instability by forming a strong and a single communist centre, and ultimately achieve stability and prosperity." According to the manifesto, the per capita income of each Nepali would be increased to USD 5,000 within 10 years. It also proposes to develop the Kathmandu Valley as an integrated town. Oli said that election manifesto of the alliance was commitment to nation building. He made it clear that the manifesto has ensured nationality, democracy, unity, peace, stability and development in the nation. "By unveiling the manifesto we have guaranteed alleviation of poverty, employment, healthy environment and fulfilling the millennium development goals," he said. "No one should be afraid from the current electoral alliance and proposed party unity between the CPN UML and CPN-Maoist Centre," Oli added.